Medium in size and created in an Industrial style, its round design is both charming and modern making it a highly desirable fixture in the Urban Ambiance portfolio. Dallas is one of the largest cities in the U.S. yet still holds on to its cowboy mentality. This has led to the city embracing the modern farmhouse trend. The Dallas Collection typifies this style. Made from high-purity steel-glass with our stately Antique Black finish. Superior workmanship backed by a 10 year electical components warranty and a 3 year finish warranty (original purchaser). 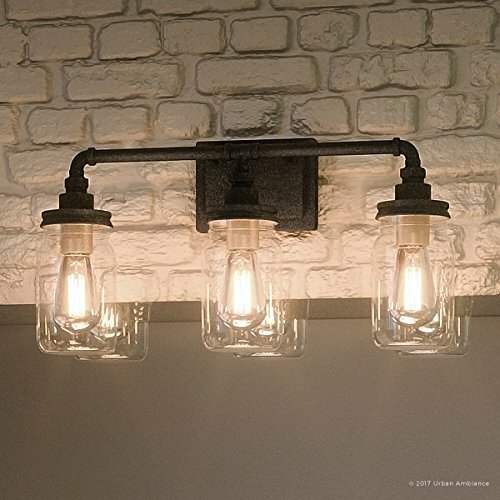 STYLE AND DESIGN INSPIRATION: Medium in size and created in an Industrial style, its round design is both charming and modern making it a highly desirable fixture in the Urban Ambiance portfolio. Dallas is one of the largest cities in the U.S. yet still holds on to its cowboy mentality. This has led to the city embracing the modern farmhouse trend. The Dallas Collection typifies this style. MATERIAL, FINISH AND WARRANTY: Made from high-purity steel-glass with our stately Antique Black finish. Superior workmanship backed by a 10 year electical components warranty and a 3 year finish warranty (original purchaser). If you have any questions about this product by Urban Ambiance, contact us by completing and submitting the form below. If you are looking for a specif part number, please include it with your message.